A double-sided leaf can be added to the Cook Islands football history books with the country hosting its first Oceania regional tournament and having four of our own referees officiate on home turf for the first time with the FIFA Referees’ Association. Cook Islands’ referees Tupou Patia, John Pareanga, Terry Piri and Robert Savage joined a team of referees from all over the region to officiate the Championship which kicked off last Wednesday at the CIFA Complex, in Matavera. Thrilled at the opportunity to referee her first tournament in her own country was a proud moment for FIFA Referee Tupou Patia. “I have been refereeing games all over the region and I feel so honoured that we got this opportunity to bring a tournament home. 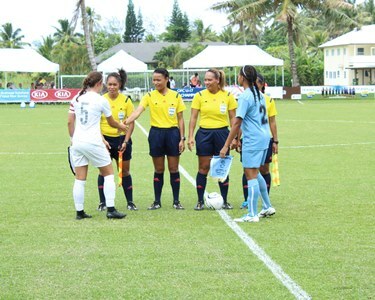 Patia refereed the first match of the tournament between New Caledonia and Tonga with Pareanga and Piri assisting her. “It was a refreshing experience that I got to enjoy with my brothers on the side lines. “It was their first time as assistant referees in the tournament and I think it was definitely something for all of us to be proud of,” Patia says. CIFA Referee Coordinator Lai Gukisuva said it was great to have the referees participate in the tournament. Patia noted that the tournament gives her a platform to encourage other young women in the Cook Islands to take up refereeing. “People don’t realise how important the role of referees is and we need more women to take interest.